What are your thoughts on the new Go Girl? Leave it to the people in Minnesota to come up with something this innovative. Now women can pee standing up. Take a peek and share your thoughts! 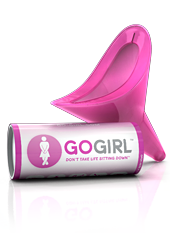 Women can pee standing up with Go Girl Female Urination Device. Absolutely the most ridiculous item ever conceived…sad proof that some confused women mistakenly believe they need to become men to acquire power. Hmmm…. I applaud the innovative thinking. This is the type of thinking that moves society forward. I think there’s going to be a cultural adoption issue with the masses in that it is just fundamentally opposite of how us girls were programmed from when we were little; however, now is the time to introduce a product like this that could expand the parameters of that fundamental programming for the future. Who the hell is going to haul that bright pink device around in their purse? I suppose Go Girl will be the hit of this year’s Christmas gift exchange. Then, I guess it’s more useful than a pet rock. I’m speechless. Do you think the “FUD” acronym (from the website) will catch on?